Trying to manage the life of an American River College student can be next to impossible. Juggling classes, jobs, relationships, and other daily activities can be pretty overwhelming. Some students have to manage all of that plus need the support of a service animal to get them through their everyday lives. Kaitlyn Joseph, a 19-year-old psychology major at ARC, has used the support of her service dog Gatsby for three years. Gatsby is a 5-year-old yellow Labrador retriever. Joseph uses Gatsby to detect blood sugar levels and provide therapy to people with higher stress levels. Joseph not only uses the support of a service dog, but she has also been training them since she was 11 years old. Three years ago she volunteered for the Dogs for Diabetics program, where she first encountered Gatsby. She worked with Gatsby and taught him the ways to alert a person, letting their owners know through a specific act that their blood sugar is raising or dropping. After training Gatsby for a while, Joseph realized something that would change her life. Gatsby had started to alert her as if she detected low blood sugar. After being checked out, Joseph was diagnosed with low blood sugar and realized that she needed a service dog for herself. During this time, Gatsby had finished his training with Joseph and had been sent to live with another woman. Joseph isn’t the only ARC student on campus that trains service dogs. 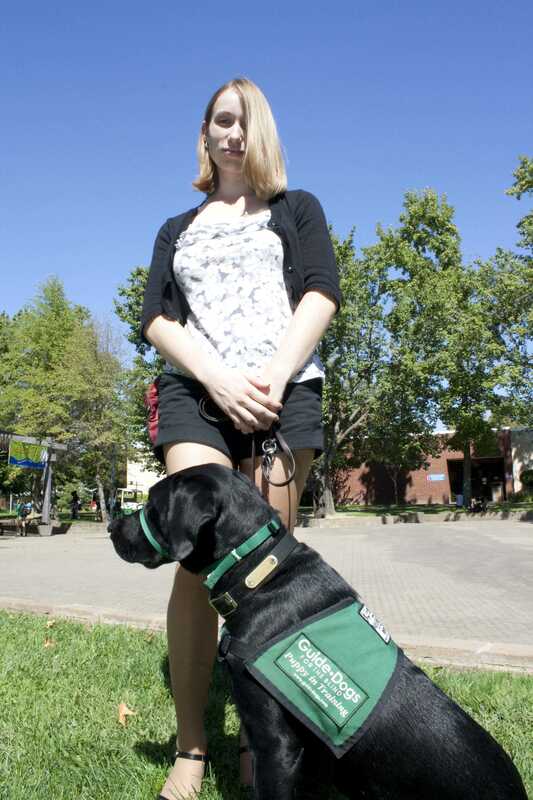 Kaitlyn Nickel, an occupational therapy major at Sacramento City College and ARC, has trained two service dogs in the last three years. She has trained Clement, a 1-year-old black Labrador, since he was eight weeks old. After Clement is trained for another year by Nickel, he will graduate and be released from her care. Once Clement is trained, he will go through a three-week program with the person who has signed up and been chosen to receive a service dog free of charge. Joseph has not experienced many problems on the ARC campus, but some students have not understood the correct way to deal with a service animal. Nickel and Joseph both agree on the proper etiquette associated with a student’s interaction with the service dog. They explained that one of the most important things to remember is that students should first ask the trainer or the owner if it’s okay to pet the animal. Secondly, students need to understand that the dogs are working. The duty of the dogs is to help people with disabilities. The dogs, if easily distracted, “could potentially harm the owner, especially if they’re blind or deaf,” according to Nickel. Be the first to comment on "From canine to caretaker"